Winter should not put an end to your intensive grazing rotation. If you have prepared high quality pastures for winter grazing, then the strategies discussed in this article will help you ration out your winter pastures, slice by slice, instead of confining your cattle and feeding them expensive cattle feed rations. Although the rotational grazing strategies used during the winter are somewhat different than managing a pasture rotation during the growing season, intensive grazing during the winter is actually much simpler than grazing at any other time of the year. All you need is a really good winter grazing plan. It is vital to pre-plan the flow of your entire winter grazing rotation to account for all the weather and grazing conditions that your cattle will encounter during the winter grazing season. maximize how long you can safely continue your winter grazing season. Grazing in winter is actually much simpler than managing your intensive grazing program during the growing season. During the summer you need to carefully manipulate your pastures to prepare the perfect winter grazing 'crop'. But once the growing season ends your intensive grazing strategy becomes much simpler because you only need to ration out your winter pastures, one slice at a time, until you either run out of pasture and switch to stored feed or the next growing season arrives. Rolling up portable electric fencing in winter in preparation for the next day's grazing slice. Grazing Rule #7: During the winter, ration out your 'crop' of winter pastures using small daily slices of pasture. Plan the 'flow' of your winter herd migration in advance so you can time the grazing sequence of your winter pastures according to the requirements of your winter livestock water system. Pre-planning the 'flow' of your winter grazing season also allows you to prepare for the weather conditions you expect throughout the winter season, account for differences in snow pack around your farm, and protect vulnerable pastures against damage from trampling hooves during muddy seasons. Since the grass is not growing during the winter you can only graze each slice of pasture once. Consequently, you should plan a logical grazing progression - your winter grazing plan - which shows where you want your cattle to be at any given time during the winter. Create a winter grazing map that shows how your cattle will move through your winter pasture rotation in such a way as to make optimal use of the pasture grass that is available. Plan the timing of your intensive grazing progression according to the different conditions that your cattle will experience over the course of the winter. Start the winter grazing season with the shortest pastures as well as those that will be most vulnerable to nutrient leaching or most vulnerable to getting crushed or covered over by the winter snowpack. Save the tallest pastures for mid- winter when snow is the deepest. Livestock Bedding and Shelter During Winter Grazing - How to keep your cattle warm and dry while out on winter pasture. Cattle Water? - Let Them Eat Snow! 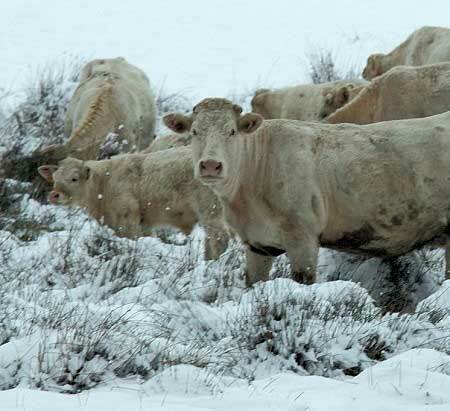 - How to safely rely on snow as your cattle's primary drinking water source during the winter pasture rotation. And cow/calf producers need to read these two articles about calving in order to understand why winter grazing with a cow/calf herd is only possible if the calving season is scheduled during the growing season, on pasture, at least 3 weeks to a month AFTER the grass has resumed growth and the cows have had time to re-fatten to a Body Condition Score of 7 PRIOR to calving. The Ideal Calving Date for Raising Cattle - How to choose the perfect calving season to fit your intensive grazing program. You can learn more about how to draw your ideal winter grazing plan in the Electric Fencing section, starting with the article about planning your electric fence installation. Or view the example pasture rotation and farm plan, which illustrates the different intensive grazing management strategies used on one farm at different times of the year. The images below shows cattle winter grazing on the farm used in the example farm plan. A fresh single-day's grazing slice* in a winter pasture rotation (above), and with an overlay of the grazing plan (below). *although a back-fence is not necessary to protect previously-grazed slices during the winter intensive grazing season, the next day's grazing slice is, as always, already staked out to prevent losing more than a single day's grazing if the cattle break down the front fence of their grazing slice. How short should pastures be grazed after the growing season ends? Grass goes dormant when the growing season ends, which allows frost to kill the entire grass plant above ground without impacting the next year's re-growth. Roots become inactive without dying back, essentially preserving the root mass that they built up at the end of the prior growing season. This root mass is responsible for providing the initial growth spurt when the next growing season returns. The above-ground plant material of the dormant grass is therefore no longer required to either maintain the root mass, nor is does it play a role in the next spring's grass growth. It can therefore be grazed off completely without harming the next spring's growth. Grazing grass short during the winter is actually beneficial to the grass. Grazing the grass close to the ground during the winter actually makes room for next year's spring regrowth because it removes dead plant material that would otherwise choke out some of the new grass shoots that emerge next spring. Intensive Grazing Implication: While you should leave at least a 6-10 inch tall grass stubble during the growing season, once the growing season ends you should change your grazing strategy to grazing really short so that you use up each slice of pasture completely before moving on to the next slice. Intensive grazing during the winter should revolve around using daily pasture moves. Each new slice of pasture should be sized so it is completely used up in a single day's grazing. Daily pasture slices ensure that the cattle get consistent quality grass every single day. When cattle are only provided enough pasture each day for a single day's grazing, it forces them to eat the entire plant. The next day they get fresh untouched grass in the next day's intensive grazing slice. But when cattle get access to more than a single day's worth of grazing in their winter pastures, they will top-graze the pasture on the first pass, consuming the most tasty, most accessible, and most nutritious parts of the pasture on the first day. After that they will only have access to the previous day's leftovers, which will be less nutritious than parts that they top-grazed the day before. This means that in large pasture slices, which take longer than a single day to graze, the pasture quality will deteriorate steadily after the first day of grazing. That means less nutrition and more grazing effort for less calories. That also means unnecessary stress on your cattle because of the inconsistency in their feed quality. Daily grazing slices in the winter ensures that the cattle are better able to maintain weight gains during the early part of winter and minimize weight losses as the winter progresses. It also allows them to keep warm in the winter because they are receiving sufficient energy each day to meet all their needs. And it ensures they have access to sufficient calories every single day to maintain the energy reserves required to stay healthy during this more challenging time of year. Daily pasture slices also minimize trampling losses in your pastures. The old saying is that cattle feet consume seven times as much pasture as cattle mouths. Daily grazing slices ensure that the cattle consume all the grass in the pasture right away before starting to wander around. Grazing slices that last longer than a day cause vast amounts of pasture to be lost to trampling cattle hooves, which will severely shorten your winter grazing season and increase your need for expensive cattle feed. And in the winter there is no second chance to graze a pasture. Once trampled, the grass will be lost to the cattle since it's no longer growing. It won't stand back up. Trampled grass will be crushed into the soil and be lost forever. When cattle spend multiple days in a single grazing slice, they become vulnerable to any snowstorms that occur after the first day of grazing, which could completely bury the short, half-eaten grass. Losing partially-grazed pastures to snowstorms will seriously reduce the length of your winter grazing season and exposes the cattle to short-term feed shortages, feed stress, and calorie shortfalls. Daily pasture slices eliminate this risk. Daily intensive grazing slices ensure that the grass is used up completely during each single day's graze before it is lost under a blanket of fresh snow. Once snow is disturbed it turns to 'concrete'. Disturbing snow causes the snow crystals to re-crystallize and bind together because the air particles trapped between the snow crystals are removed. This makes disturbed snow very, very hard. And snow only takes a few hours to harden, or set, after it is disturbed. Daily pasture moves in your winter grazing program ensures that the grass in each pasture is completely used up in a single day's worth of grazing, before the disturbance caused by intensive grazing causes the snow to re-crystallize and lock away access to the pasture below. The miracle and curse of disturbing snow - snow huts and snow-covered pastures. Snow sets hard as concrete within hours of being disturbed. That's why you can build a snow house (called quinzee or quinzhee) in the winter by heaping snow together. No matter how light and fluffy the original snow was, by disturbing it to create a snow pile you are causing the snow to recyrstalize. 1-2 hours after heaping even the lightest of snow together it will recrystallize and become so hard that the snow pile can be hollowed out completely as a snow hut and it will not collapse. By next morning a hollowed out snow house with 10-12 inch thick walls is typically strong enough to allow you to stand on the roof. That same re-crystalization happens to snow when cattle disturb the pasture during intensive grazing, effectively locking the grass under the hard snow and preventing cattle from being able to graze across the same pasture twice. That's why winter grazing depends on using FRESH daily pasture slices every single day. Using daily pasture slices during your winter intensive grazing program is also vital to your manure management and soil fertility. Daily grazing slices ensure that the cattle manure is spread evenly throughout your winter grazing areas. As soon as the cattle have access to multiple day's worth of pasture, they will start re-using favorite bedding areas for ruminating and sleeping. This causes the valuable nutrients from your pastures to be removed from the overall pasture and concentrated instead in a few small areas. The pastures will consequently need more fertilizer during the next growing season, and the areas where the cattle bed down are at risk of being over-fertilized (burnt off), trampled, and damaged. Bedding down in the same area more than once also starts increasing the disease pathogens that the cattle are exposed to, thus increasing your health costs. Managing disease risk in areas where manure is allowed to build up forces cattle producers to start collecting and storing manure as well as providing bedding areas for the cattle to sleep on - two things that you absolutely want to avoid in order to keep costs down. Daily pasture slices keep the cattle away from manure build-up and keeps the manure spread evenly in the fields where it can benefit you as a fertilizer. Just because there is snow piling up in the pastures does not mean you need to abandon your winter intensive grazing program. Follow the link to learn how to train your cattle to graze through deep snow. Successful winter grazing requires that you monitor your pasture quality to ensure that the cattle are receiving sufficient protein, energy, and minerals to keep them safe and healthy. You need to know that the pasture quality hidden under a blanket of snow is actually worth digging for. The simplest way to monitor pasture quality is to have a monthly forage sampling program that analyzes the pasture quality from month to month, throughout the year. Give these forage analyses to your livestock nutritionist who will calculate if your cattle are receiving sufficient calories from the pastures to stay warm and keep their body condition within safe limits. The nutritionist will also calculate a supplement mix to make up for minor shortfalls protein, energy, or minerals so you can safely continue intensive grazing longer even as the pasture quality begins to deteriorate during the winter months. The protein and energy supplements can usually be mixed into the mineral mix in the mineral feeder. The salt content in the mineral mix keeps the cattle from gorging on the supplements. Your nutritionist will be able to tell you in advance, based on your forage analyses, when your pasture quality will deteriorate too much to provide your cattle with sufficient calories, without excessive supplementation costs, to continue intensive grazing without risk to your cattle's health. This give you a very clear idea of how long you can expect your rotational grazing program to last each winter (it will get longer each year as you improve your winter grazing skills and as you get increasingly skilled at creating high quality winter pastures). This also gives you a very good idea of the minimum amount of cattle feed you need stored on hand for after the winter grazing season ends. While you should always continue to use body condition scores to monitor your cattle's health and body fat levels throughout the winter grazing season, working with a livestock nutritionist takes the guess work out of your winter grazing program. You can find additional cattle nutrition tips to reduce your cattle's energy and protein needs during the winter by following this link to the cattle nutrition tips to extend your winter grazing season article. These tips will help you extend your winter intensive grazing season still further and will reduce the cost of the nutrition supplements required to support your winter grazing program. The Planning for Winter Grazing chapter of Grass-Fed Cattle explains in detail how to set up your monthly forage analysis program and how to work with a livestock nutritionist. If you live in a frost-prone area you'll need winterized water sites to provide your cattle with drinking water. However, once your pastures are no longer growing you can allow your cattle to walk back across previously-grazed pastures to reach your winterized water sites. Only a handful of frost-proof cattle waterers in strategic locations around the farm will do. Design your winter intensive grazing rotation to start near the livestock waterer and work outwards, increasing the walk to water with each new grazing slice. This ensures that the cattle won't trample ungrazed pastures. If you get snow in your area, this ever-increasing distance to the water trough encourages the cattle to start eating snow for their drinking water needs as the walk to the trough becomes too tedious for them. Follow the link to learn how to train your cattle to eat snow to meet all their drinking water needs during your daily winter pasture rotation. This article explains how snow can be used safely as a source of drinking water as long as you follow a few basic guidelines during winter grazing. Plan your winter grazing rotation so that by the time the winter ends and the spring melt begins your pasture rotation has led you back near the water troughs. The short distance to water during the spring protects your pastures from trampling damage while the ground is muddy and the frost is coming out of the ground. Grazing close to your water troughs is also very important once the spring melt begins to protect your cattle's health. By minimizing the distance to the water trough during the muddy spring thaw, you are encouraging the cattle to go to the trough to drink instead of drinking out of bacteria-filled puddles. This is crucial for reducing disease pressure in your cattle herd during the spring. Also, make sure mud season is spent on your firmest, highest, best-drained ground so that the grazing cattle don't damage pastures during the spring thaw. As long as you saved your best-drained pastures for the spring grazing season, you can generally continue grazing right through the mud season. Nevertheless, it is worthwhile to have enough hay reserve in your plan so you can pause your intensive grazing program to feed hay for a week or two during the worst of the mud season when the frost is just coming out of the ground. If you don't have some well-drained pastures to set aside for the spring thaw, feeding hay for this brief 1-2 week window is a good way to prevent your cattle from turning your pastures into mud bogs with their hooves. Always, ALWAYS, keep a winter hay reserve as an insurance policy to prepare for emergencies. No amount of successful winter grazing seasons exempts you from this requirement - it is a key component of successful winter pasture management. Always keep an emergency hay reserve for summer drought, winter pasture shortages, feed during ice storms, to protect pastures during the spring thaw, and to give pastures a chance to catch up during the growing season. No matter how many years experience you have with intensive grazing during the winter and how long you've been able to avoid feeding stored feed, always have a hay reserve set aside for emergencies for the exceptional drought, the exceptional storm, the chinook-induced thaw-freeze cycle of the century, or if your winter pasture quality simply deteriorates faster than anticipated because of weather conditions during or after the end of the growing season. You can add to your emergency hay reserve during years when hay is cheap and reduce your old stock of hay by selling it in years when hay is expensive, allowing you to maintain a 'fresh' insurance policy at no cost. Hay will easily keep up to 10 years if it is stored under cover in a dry place. Silage, on the other hand, does not work well as an emergency feed reserve because it has a best-before date of only a few years and cannot readily be sold and transported, which makes it difficult to maintain a replacement strategy to keep it fresh if you do not feed it to your cattle. Novice winter grazers should have enough hay on hand to cover the full winter feeding season so they can afford to make mistakes with their winter grazing program. However, over time, experienced winter grazers will be able to reduce their winter feed reserve as they learn how to properly prepare their winter pastures and work out the details of their winter pasture rotation. Winter Grazing Tip: Working towards a year-round grazing season. Do not expect to achieve 12-month long intensive grazing in your first year(s). Grow into it. Build your skill-set. And make sure you have a backup plan to help you through the growing pains of learning a new skill. In your first year, store enough hay to cover the full length your typical winter feed season so that your first learning experience with winter grazing doesn't turn into a disaster. The hay is your insurance strategy. Keep grazing as long as your winter pastures last, or as long as your forage analyses show that you can continue grazing safely, or as long as your cattle's body fat reserves remain within a safe range (see body condition scoring), or until weather conditions prevent your cattle from accessing your pastures. Make note of what went wrong and, just as importantly, what went right. Make the necessary adjustments to both your summer and winter grazing strategies so you can have an even longer winter grazing season next year. As you gain experience with preparing your pastures for winter grazing, you'll find your winter grazing seasons lasting longer and longer. Soon you'll see that 12-month long grazing is within your reach. Grazing Management Summary - a handy stripped-down reference list of the seven Core Grazing Rules that every grass-fed beef producer needs to know in their sleep. 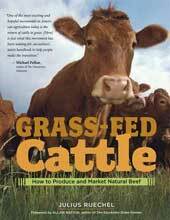 Raising Beef Cattle on Grass - Learn how to prepare your cattle herd for winter grazing. 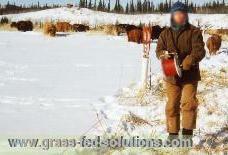 Winter Grazing - How to train cattle to graze through deep snow. Intensive Grazing - Preparing Pastures for Winter Grazing - (Grazing Rule # 6) Learn how to create the perfect winter pastures to extend your grazing season long after the growing season ends. Electric fencing and cattle water in winter - Part IV of the Smart Electric Fence Grid article series. Cattle Nutrition Tips - Safe strategies to reduce your cattle's nutritional requirements so you can extend your grazing season deeper into the winter.